When you press the Y button on your Gamecube controller, you'll be taken to a section of many menus. Each screen will give you a little bit of information about how well you are doing on your farm and with Flower Bud Village. You can rotate through the different menus by pressing the L and R shoulder buttons. 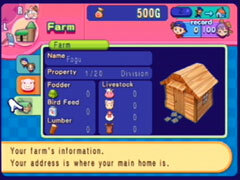 Farm: This is where you can see your own character, the friendships you have with your pets, and even the size of your farmhouse. Animals: The number of cows, sheep, chickens, and horses appear here, along with the number of hearts each animal has. The more hearts, the better the produce you can collect. Shipped Items: All of the things you have tossed into your shipment box are tallied up in this screen. There is a section for your crops, for the different fish you catch, for the cooked recipes, and then an other area where ores and jewels appear. Village Map: If you ever get lost you can view the map. 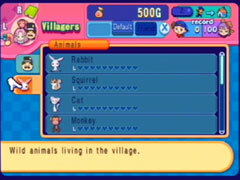 It also tells you the location of the other villagers! If you can't find someone then check the map and their face will appear at the spot they're located at the moment. Notes: The musical notes that you've collected will be listed here. There are 100 different notes to discover. Villagers: Your friendship with the villagers and wild animals are documented here. As a person's heart marks increase, different events can occur. You need to have at least 8 hearts on the person you wish to marry. Memo: This is a summary screen that lists your accomplishments, like what cooking recipes you know, how far down into the mines you've gone, and so on. The memo also tells you how well you're doing against Jamie, the rival farmer. Even if you are doing better than he/she is, nothing spectacular ever happens. Belongings: What you currently have in your rucksack go here. To get more space in your bag go to the Tool Shop and purchase a larger rucksack. The biggest rucksack comes from Martha.